Advent is a time to put your faith at the forefont. It’s a time to snuggle up next to the fire and imagine the Baby Jesus snuggled in swaddling clothes in the manger. It’s a time of anticipation, of waiting for our King, of dreaming of the joy we will have in joining him in Heaven. I love Advent. It makes me think of crisp cold days, dark nights and a time to burrow. Gone are the busy days of summer, of travel, of activity. It’s a wonderful season to use that burrowing time to renew our faith, remind ourselves of the gift we have been given and reignite that fire lest we be lukewarm for the arrival of our King. While email is NOT my favorite thing (I get WAY too many), I LOVE email about my faith. In fact, I make it part of my daily routine to read my faith emails while taking my dog for a walk :). Usually that includes reading the USCCB’s email of the daily readings, Bishop Robert Barron’s reflections on the daily readings, the Divine Mercy Daily, Catholic News Agency’s daily round-up and a Mary’s Moms group I am a part of who pray for one another daily. Matthew Kelly was one of my favorite authors early on in my conversion to Catholicism, especially his “Rediscovering Catholicism” book. He has a real gift for explaining Catholicism in ordinary ways that are easy to understand, as well as relating the faith to everyday life. He is a great place to start as a Catholic newbie or for someone who doesn’t like to dive deep into theology. 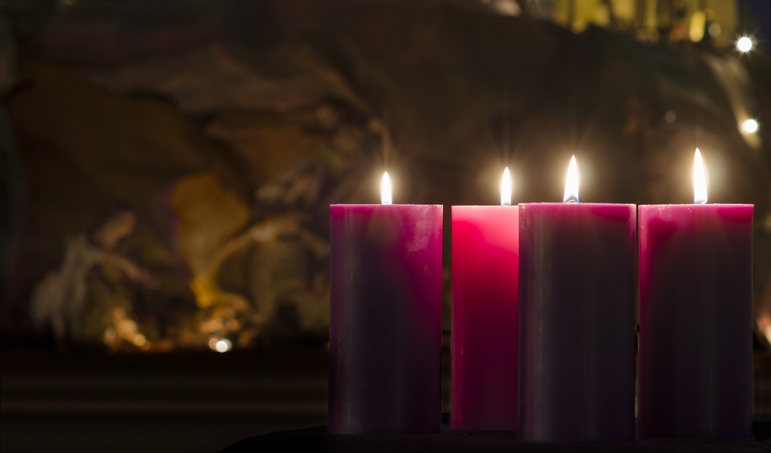 This series offers his daily reflections on the season of Advent. Bishop Robert Barron is my current favorite person to follow when it comes to delving deep into the Catholic faith. The creator of the popular “Catholicism” video series and many wonderful series since, Bishop Barron goes a bit deeper, but does a fantastic job of explaining the theology of Catholicism to the average viewer or reader. These daily reflections offer his thoughts on the Gospel Reading of the Day in the Catholic Church through Advent and beyond. Pray More Novenas is a nonprofit with hundreds of thousands of readers, which sends out regular novenas (prayers prayed over nine consecutive days) via email. If you’re the type (like me) who can’t seem to remember to pray a prayer nine days in a row, Pray More Novenas sends it to you via email so you can’t forget! Awesome! They offer a special Advent retreat with videos from speakers on a variety of topics related to Advent. They do ask for a donation, but if you can’t pay anything, you’re still welcome to register. This retreat is offered from the Carmelite order perspective. They send a lengthy reflection each week that also includes prayers to pray each day. Visit this page and click on the Week 1, Week 2, Week 3 and Week 4 at the top for a daily reflection, action you can take and prayer. Visit this site from the United States Conference of Catholic Bishops and click on the current date for a reading, reflection, action and prayer. This is a book I have read in the past and will be reading again this Advent. It’s a wonderful walk through Advent, taking a look at various people in the Gospel, including John the Baptist, Mary, the Wise Men and more. 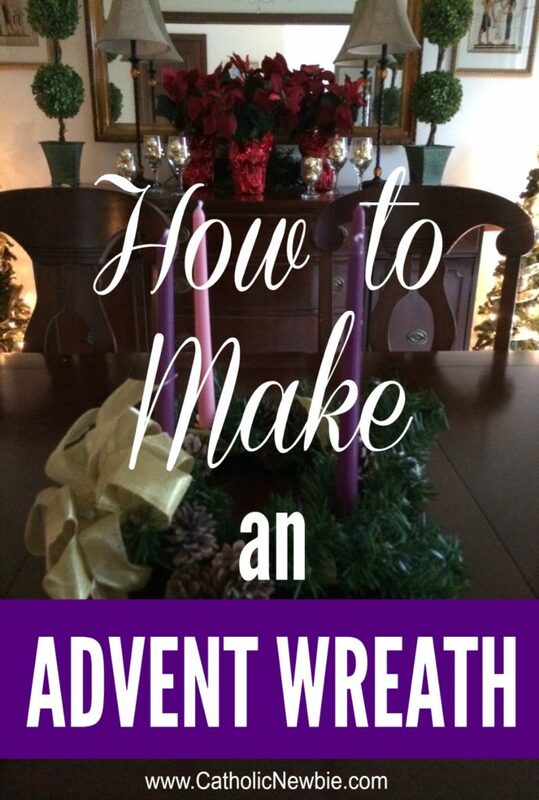 If you’re a Catholic newbie like me, you may not have an Advent wreath. In fact, I’ve run across plenty of longtime Catholics who’ve never had an Advent wreath! Problem solved! Just follow these simple steps that even a non-crafty person like me can do easily, and you’ve got a new tradition to hand down through your family. Thanks to St. Alphonsus Liguori Catholic Church for this idea. You should be able to find most of the items at your local craft store. The metal frame for the wreath and Advent candles can usually be found at your local Catholic bookstore or online as noted above. 1) Take your metal frame and lay your garland on top. Use the green floral wire to attach the garland to the frame. Make sure your garland is arranged so that the wreath will sit flat on a table. 2) Add the decorative items you selected, such as pine cones or ornaments, to the garland and attach with floral wire to secure. 3) Wrap your ribbon around the garland loosely. Tie a pretty bow on one side. It’s usually easier if you create the bow separately and then tie it on with the ribbon you used to wrap around the garland. Remember to light your candles each Sunday of Advent. Use a prayer such as this Blessing of an Advent Wreath while lighting each candle. Check your local parish for free Advent materials with prayers, as well.